Day 1  Arrival in Bali. Obtain your visa at the airport upon arrival in Bali (do not get your Indonesia Visa in advance for this trip). You will be met at the airport by your guides and transferred to your hotel. 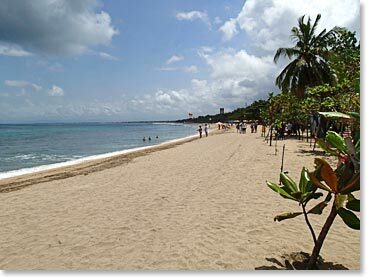 Day 2  Our first day in beautiful Bali will be for relaxing and enjoying the island of paradise. This is also an important day for allowing possible delayed baggage (or passengers) to catch up before our departure for Timaka, Western Papua. There will be a team expedition briefing in the afternoon and in the evening we will prepare for our 12:20 am flight to Timika. The beautiful beaches of Bali make for a relaxing first day! Day 3  We will board a 12:20 am flight to Timika. Arrival in Timika, a small coastal town located south of Carstensz Pyramid. From here we will board another flight to Ilaga or Sugapa, the small villages which are the gateways to our adventure. Depending on flights we will spend the night either Timika, Illaga or Sugapa. Delays on departure from Timika are not uncommon. Motorcycle rides to the trailhead of our adventure! Day 5 to 9  The trek begins! For the next 5 days we will trek through thick jungle terrain on our way to Carstensz Base Camp. We will be hiking for 7 – 9 hours each day. The early days of the trek will be at lower altitude but finally we will approach and cross New Zealand Pass at 14, 800 ft / 4500 m and descend to our Base Camp (12,400ft / 3,780m). Day 10  Today we will arrive at Base Camp, most likely in the late afternoon. The afternoon will be for resting and preparing for summit day. Our Base Camp set up by a beautiful blue lake. Day 11  Summit Day. Acclimatization is not normally an issue by the time we have arrived at Base Camp and we often make our summit ascent the following morning. Summit day is long; normally 12 + hours, round trip. You will be rock climbing on solid, but very abrasive limestone rock all day. First we will ascend 1600 feet (500 meters) of rock at 3rd and 4th class climbing difficulty. When the summit ridge is reached we will traverse along a ridge that has notches. These gaps in the summit ridge provide the most difficult climbing of the day. Belays will be offered or lines fixed wherever necessary throughout the summit day. The most difficult rock move of the day is rated at 5.8, but we typically get past this section via a thrilling Tyrolean traverse. Descent from the summit is via the same route and fixed lines will be left in place. We often do a series of long rappels on descent in order to save time and to save energy when we are more tired. Day 12  Alternate Summit Day. Useful if we think the weather will be better on the second day, or if we decide a day of rest before climbing is a good idea. Day 13 to 16  For the next four days we will trek back through the jungle towards Ilaga and Sugapa. Day 17  Arrival in Ilaga or Sugapa. Here we will rest and wait for flights to Timika, depending on flight availability. Once we arrive in Timika we will attempt to catch a connecting flight to Bali, again depending on flight availability. If we do not catch the connecting flight we will spend the night in Timika. Day 18  Alternate flight day to Timika and Bali. When we catch the connecting flight to Bali you will be met at the airport and transferred to your hotel on this peaceful island. Finishing a Carstensz Pyramid expedition by soaking your feet in the oceans in Bali! Day 19  Alternate flight day to Bali. Transfer to your hotel. Day 21  Return home. BAI TRIP ENDS.